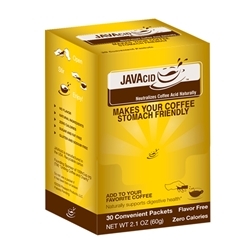 Have one box (30 packets) of JAVAcid shipped to your doorstep automatically each month, or pick your own delivery schedule. Subscriptions are easy to cancel at any time. I have Interstitial Cystitis and I wish I heard about this product sooner. I have been able to eat red tomato sauces and salsa again. Been using this product since Jan 2017 when I tried the sample for $2.00 While I still take a prescription for Xantac for acid reflux, what I noticed with the addition of Javaacid, my heart burn never kicks in with my 2 morning cups of coffee. It's worth the recurring order price to have this extra peace of mind.